Making - from the bench…not quite…but from the beach! 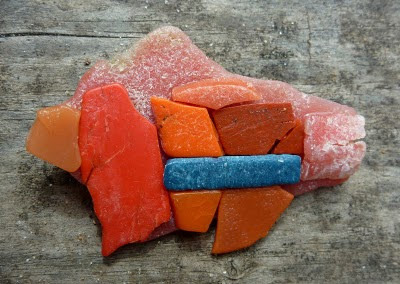 The following 3 brooches were made whilst away over the school holidays in a magnificent place called Harmers Haven. 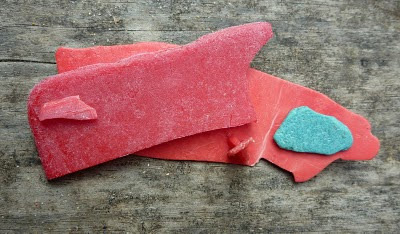 Although I have a history of hesitating making from recycled remnants (only because I am never able to decide what to do with them), I was drawn to collecting mostly red pieces of plastic from the beach. As I was collecting a very clear image was forming in my mind as to how they would go together……nothing original here but I enjoyed the spontaneity. Superglue from Wonthaggi supermarket, brooch pins from the bead shop and voila! They will remain down at Harmers Haven as the owner has quite a social life down there and I thought she might like to wear them on rotation to her lunch and dinner dates. 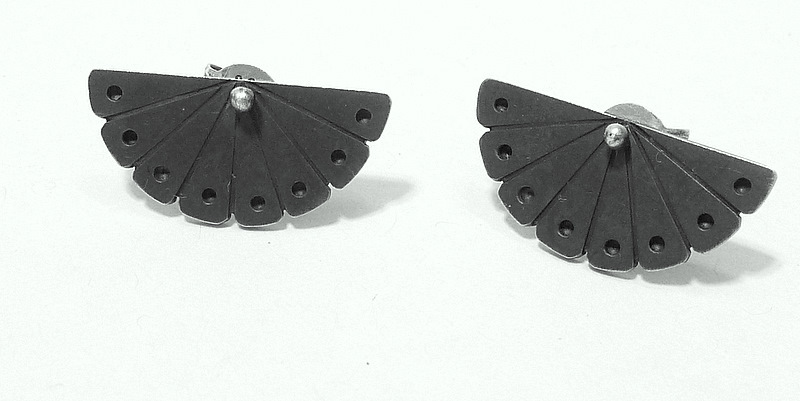 Wearing – Cass Partington earrings, sterling silver, oxidised fans. I received these from Cass for my 40th and have worn them almost every day since then…..guess how long that has been! Viewing – yesterday I went to a lecture at NGV Australia titled “With Mari” obviously referring to the late Mari Funaki. This was given by Otto Kunzli. It was actually more like a eulogy, quite an intimate, personal account of Otto’s journey with Mari. The slides accompanying his ‘conversation’ were mixed; some of Mari’s jewellery and sculpture, some of Otto’s work and many images of Mari very relaxed…even in swimwear (with a resort pant of course). 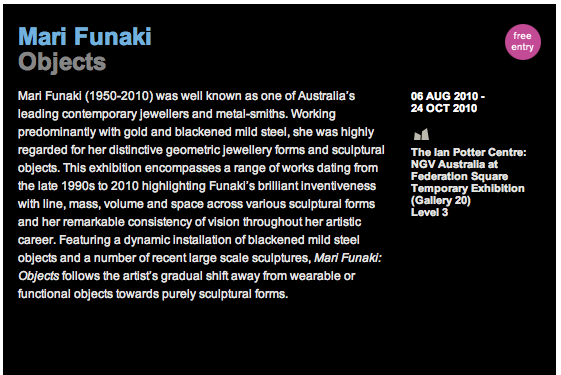 Although I didn’t know Mari well I couldn’t help but imagine her squirming at the thought of these personal images being shown at a ‘ticket only’ event at the National Gallery of Australia. It did seem rather odd. Viewing the exhibition of her sculpture was particularly moving following Otto’s talk. 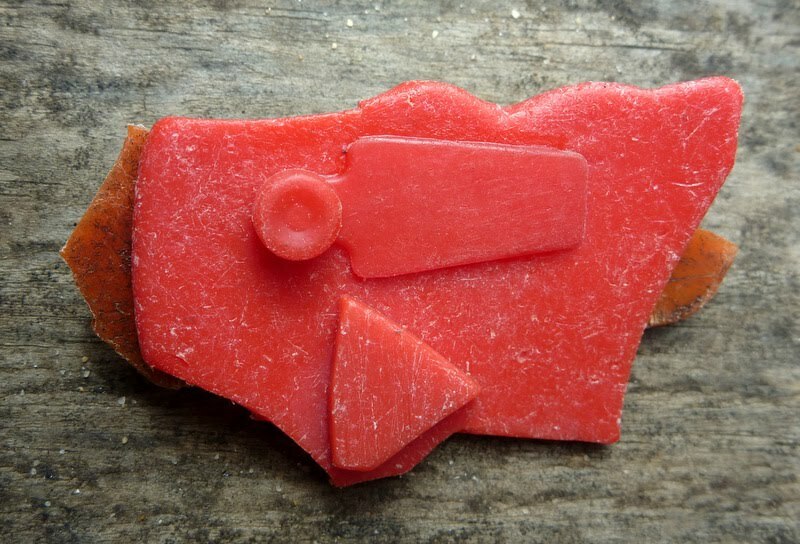 Although familiar with Mari’s work I find it continuously refreshing because there is nothing else quite like it out there in either the jewellery or sculpture world that I am aware of. Just as arresting was the exhibition next door ‘Presence’ a John Davis retrospective. John Davis was the sculpture lecturer at VCA when my partner studied there in the late 80’s so I was very keen to check it out. It was so great……..I could have stayed there for hours only I had to get home for dinner and kid business. I urge everyone to see it. Typically whilst at the NGV I ventured into the bookshop, dug deep and bought a couple of books; John Davis-Presence catalogue and Martin Parr ‘Object’. Martin Parr is a photographer with a passion for collecting and this book is documentation of some of his collections. His photography really appeals to me and his collecting helps me justify my endless passion for collecting…as he says ‘I have a very strong collecting gene’. I've been a bit busy of late and didn't get a chance to post this as soon as it came in. So when Caz writes 'yesterday', what she really means is 'oh about a week ago'. 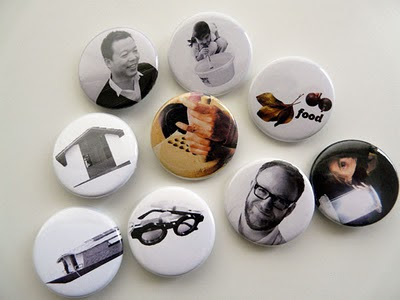 Thanks so much Caz (visit her blog here) and those brooches are totally rocking!! Making - A thousand badges for adorning plain delegate bags and volunteer tee shirts. Today marks the start of the conference I have been working tirelessly towards for the past 5 months or so. The ideals behind this event were to connect great thinking minds with appropriate contexts, to provide betterment in standard of life in the South East Asia. All too serious I know, which is why it was appropriate to have a little fun with the last objects I made for them, badges! We don't need another tee shirt stamped with logos. 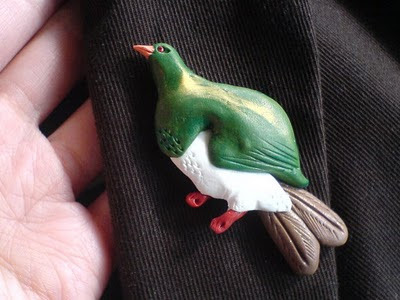 I collect bird brooches to remind me of my ideals and my obsession with the notion of flight. Complete with golden highlights and a partial fingerprint, this wood pigeon is a must wear this days, since the day I saved it from a sad rainy day in Ponsonby on my recent trip to Auckland. Looking forward to my next piece to add to this collection. 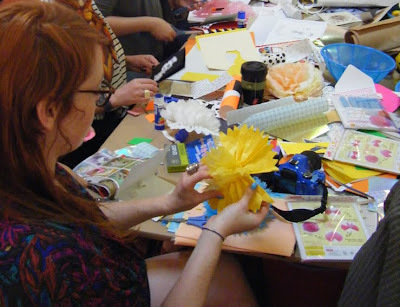 Object Gallery launched 'We craft this city' last saturday, with all day crafting sessions led by Ebony Bizys, Craft Cartel and Knitty Gritty and Loopy. And though I missed much of it, what little time I had sharing and watching people pick up new skills never seemed dull at any moment. It was a blessing to be indoors as it was raining and impossible to be outside like at Hyde Park for Art park on the previous weekend. Working with/at Object has been the best thing that has happened to me this year, with people watching coming a close second. Thank you Miss Chew. You are one rocking lady! !